Civility in political discourse, especially during poll campaigns had never been the strong point of Prime Minister Narendra Modi, whose vociferous albeit vitriolic attacks against the Congress party’s first family, have earned him a position of pride among his followers and BJP sympathizers. As Modi rejoined the BJP’s poll campaign in his poll-bound home state of Gujarat on Wednesday, the Prime Minister made his familiar attacks against the Nehru-Gandhi family, reserving the most crude jibes for heir-apparent, Congress vice president Rahul Gandhi. Amid reports that his rallies across Gujarat have been attracting fewer than usual crowds, with empty seats becoming a hitherto unthinkable fixture at his public meetings, Modi has perhaps decided to return to the basics while appealing to his followers to once again bring the BJP to power in Gujarat – a state that the saffron party has ruled for 22 consecutive years. On Wednesday, as Modi hit the campaign trail in Morbi, situated in the state’s Saurashtra region, he shed the baggage of civility that burdens the shoulders of a Prime Minister and took on his previous avatar – that of the shrill BJP campaigner and political street-fighter. What else would explain the semantics that he employed to hit out at Rahul Gandhi when he claimed that the Nehru-Gandhi scion was propagating a “grand stupid thought” by suggesting that GST rate be capped at 18 per cent? Modi’s comment was an obvious riposte to the sarcastic dig that Rahul Gandhi has been taking at the Goods and Services Tax regime rolled out by the Centre earlier this year – calling it the “Gabbar Singh Tax” while referring to the many complications and confusions that common citizens have been facing in filing their tax returns over the past five months. With Rahul campaigning across the state at the same time as him, Modi made it a point to hit out at the Nehru-Gandhi scion who, by December 5, is likely to take over as Congress president from his mother Sonia Gandhi. But the attacks against the Congress, India’s first Prime Minister Pandit Jawaharlal Nehru and his family, weren’t missing for Modi’s speech. Criticising Rahul’s visit to the state’s famous Somnath Temple earlier in the day, Modi said Jawaharlal Nehru had expressed displeasure over re-building the place of worship which in medieval times had been plundered and ransacked by Muslim invaders from Central Asia. The Prime Minister Narendra Modi credited the restoration and re-construction of Somnath Temple to Sardar Vallabhbhai Patel – a Congress leader, country’s first home minister and a Gujarati who Modi and his BJP have been desperately trying to co-opt. “If there was no Sardar Patel, the temple in Somnath would never have been possible. Today, some people are remembering Somanth, I have to ask them: ‘Have you forgotten your history’? Your family members, our first prime minister, were not happy with the idea of a temple being built there,” Modi said during his election rally in Prachi. During his rally in Morbi, where he attacked Rahul Gandhi for propagating a “grand stupid thought” – not exactly the language one expects from India’s Prime Minister – Modi sought to demolish Rahul’s ‘Gabbar Singh Tax’ swipe by saying: “Those who have looted people throughout their life, they can only remember dacoits.” Gabbar Singh was the name of the iconic villain from the Bollywood blockbuster “Sholay”. Pandit Nehru’s daughter, Rahul’s grandmother and India’s first woman Prime Minister, Indira Gandhi was also not spared in Modi’s broadside. “I remember when Indiraben had come here, Chitralekha (a local language magazine) had printed her photo with a handkerchief over her nose, trying to avoid the stench”, Modi told voters in Morbi – a town dominated by the Patidar community, a section of which has been revolting against the BJP under Hardik Patel’s leadership. Modi declared that for his party, it’s earlier avatar – the Jan Sangh – and the RSS “the street of Morbi are fragrant”. Some charm offensive! Incidentally, Hardik Patel – the face of the Patidar Anamat Andolan Samiti – was also in Morbi on Wednesday, campaigning among members of his Patidar community and urging them to vote against the BJP. With voices of discontent coming from another crucial vote-bank in Gujarat – the OBC voters– against the BJP, Modi made sure to also reach out to the community while trying to paint the Congress as their villain. “I want to assure you, Congress may try to put roadblocks… I am committed to ensure their designs fail. Parliament is meeting soon and we are going to bring that issue (Bill for constitutional status to the National Commission for Backward Castes) on the floor of the House again. We want to give our OBC communities their due,” Modi declared. 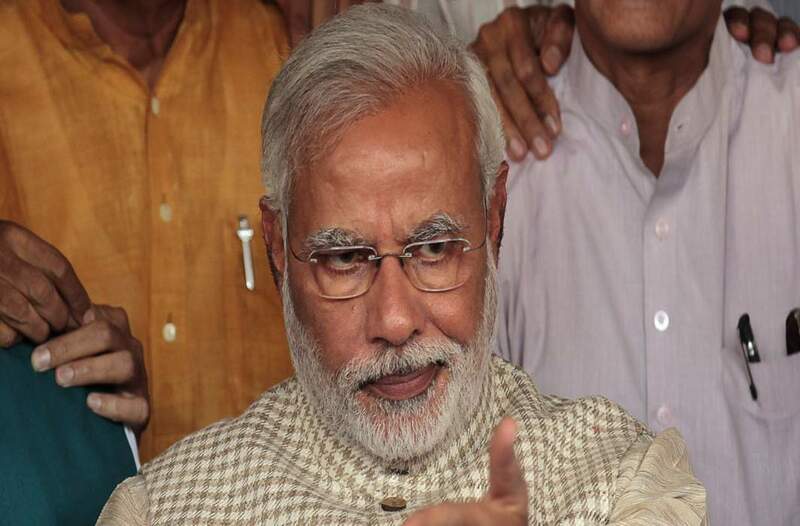 Narendra Modi is not known for being defensive during his poll campaigns – or even otherwise. But given the content of his speeches in poll-bound Gujarat, it is no surprise that his party colleague and senior MP Shatrughan Sinh feels that the BJP is showing “signs of panic and desperation” in Gujarat. By pumping in so many leaders at the same time in our own state Gujarat, like we did in Delhi, aren't we showing signs of panic & desperation in anticipation...generally speaking this kind of strategy doesnt work...we've seen it in Delhi & Bihar. Nonetheless our best wishes..! !